Woodpecker Cottage is a luxury holiday cottage for a couple, in the Welsh Marches, 5 miles south of Ludlow, in the hamlet of Orleton Common, set in a wooded valley by a babbling brook and right on the Mortimer trail, a superb walking trail running from Ludlow to Kington. It is a strictly no pets and no smoking property. The cottage has been restored from a stable that served the nearby Edwardian/Victorian country house where the owners live. 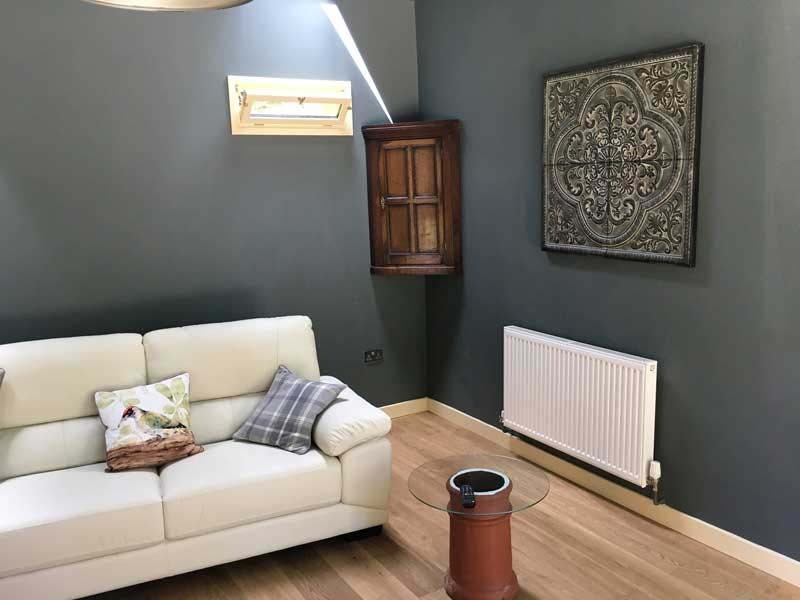 It has everything you need for a comfortable stay, all the usual kitchen appliances, including dishwasher, washing machine, microwave, coffee maker, oak flooring throughout, television in 3 rooms, big screen in the lounge, gas central heating and instant hot water boiler for the bath or shower. Wifi throughout. The bedroom has deep pocket sprung memory foam mattress, it is very quiet and peaceful well away from the hurly burly of traffic noise for a great nights rest. The cottage is surrounded by a grassy bank, a decking patio and a brick barbecue await for those barmy summer evenings. With ancient cobbles and gravel to the front.